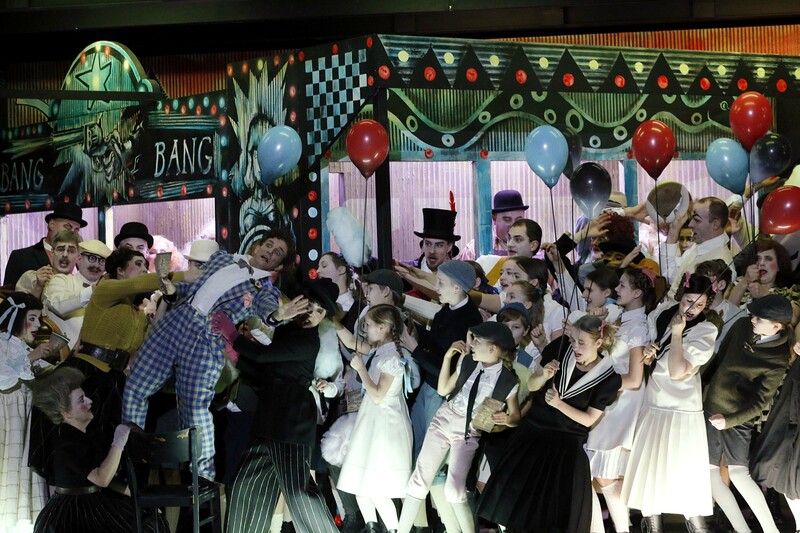 Kinderchor der Sächsischen Staatsoper Dresden, Sinfoniechor Dresden – Extrachor der Semperoper Dresden, Sächsischer Staatsopernchor Dresden, Sächsische Staatskapelle Dresden / Stefano Ranzani. Stage director – Philipp Stölzl. Semperoper, Dresden, Germany. Thursday, June 29th, 2017. 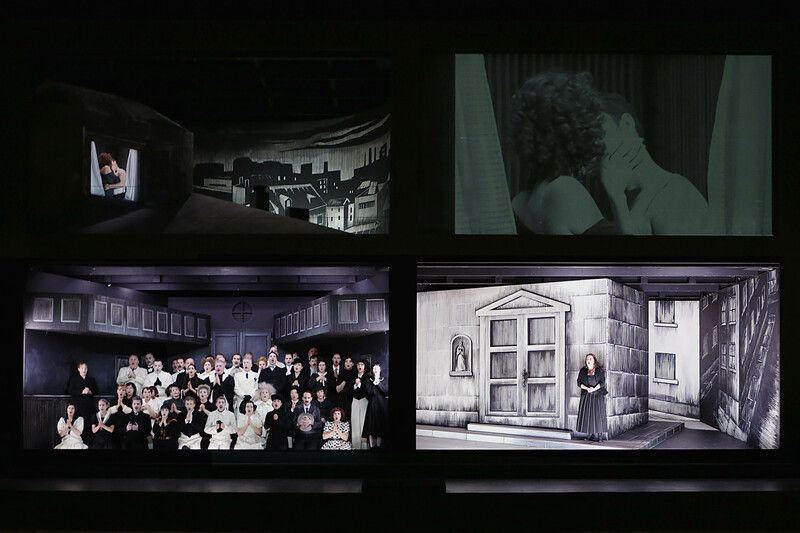 Tonight, we had a revival of Philipp Stölzl’s staging of Cavalleria rusticana and Pagliacci, a coproduction with the Salzburg Festival and first seen in Dresden in January 2016. Tonight also marked Evelyn Herlitzius’ role debut as Santuzza, a notable departure from her regular German fach into the Italian repertoire. Any visit to Dresden is a privilege with the warm acoustic of the house and its outstanding chorus and orchestra. 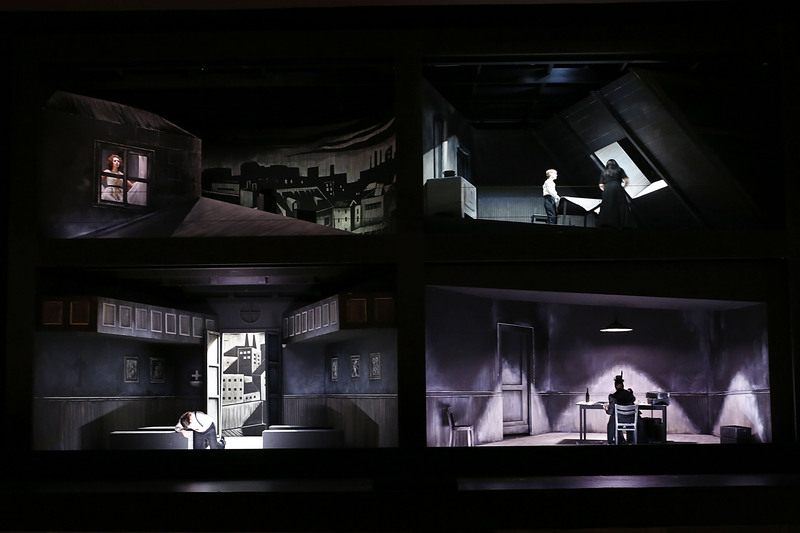 Stölzl’s production was interesting, with the stage split into a box containing four smaller boxes and the black and white visuals of Cav were contrasted with the multicolour garishness of Pag. He made use of these individual compartments to illustrate characters in various situations – Turiddu and Lola embracing in her apartment during the Easter Hymn or mafia doyenne Mamma Lucia seen tending to her affairs. At its best, it was a genuinely insightful piece of theatre. For instance, in Pag the stage was used to show backstage, the stage where the show took place, and the audience watching it. This had the effect of vividly illustrating the characters’ motivations. Indeed, the effect was magnified by the use of cameras filming the principals and projecting these live images on to curtains that covered some of the boxes during scene changes, thereby bringing a level of detail that would otherwise have been missed. Following ‘vesti la giubba’, we saw Canio’s face projected staring deep into the abyss he faced, while action took place around him – the effect was devastating. The staging was also fluently dispatched with set changes taking place behind the curtains, although they were not unheard during the music. There was, however, a downside. The constant stage business meant that at times, one didn’t know where to look and there were moments where the projected images overshadowed rather than magnified individual performances. In a way, it felt that the staging wanted to tell us as an audience what to think rather than allowing us to draw our own conclusions. The constant closing of the curtains on the boxes meant that Cav especially felt quite fragmented, and I longed for Stölzl to give some stillness and allow the narrative to lead rather than be led. Certainly, there was an intimacy and passion there and the principals and chorus had obviously been directed with care. The success of the evening was due in no small part to the excellence of Stefano Ranzani’s conducting. He clearly loves both works, was an extremely persuasive advocate, especially for Cav, and I’ll come right out and say that his reading of both works was by far the best I’ve heard both live and on record. The Cav prelude was lovingly phrased, every melody full of the passionate melancholy that abounds in the work. There was an Italianate warmth to the sound that was aided by the phenomenal acoustic of the Semperoper and the distinctive generosity of the tone of the Staatskapelle’s strings, digging deep throughout. Tempi, often swift – as in the Cav intermezzo – felt exactly right. This was the first night of this revival run and, as so often on these occasions, there were a few slips in ensemble very occasionally, mainly due to the fact that part of the chorus was in the pit due to the relatively cramped environment of the set. Yet, I found an all-enveloping warmth to the sound that overtook and forced this spectator to listen and to feel. The chorus was magnificent – this surely is one of the top three opera choruses in the world. Prepared by Jörn Hinnerk Andresen, they made a glorious noise. The blend is staggeringly good – far from the war of vibratos were are routinely subjected to elsewhere – the tone has a warmth and unanimity that is excellent. The ‘Din don. Suona vespero’ chorus in Pag was beautifully done – nicely shaded and dispatched with ravishing exquisiteness of tone. The Easter Hymn filled the theatre in a glorious blaze of sound, capped by Evelyn Hertlizius’ fascinating Santuzza. Santuzza is a role that suits Herlitzius well. Her vocal production is based on a very open, well-placed sound and this lends itself well to Italian. What struck me in particular was how well integrated the voice is with registers ideally cohesive in this passaggio-crossing role. This might have been a role debut but Herlitzius’ Santuzza is already a fully-rounded creation. As always, everything she does is based fully in the text. She was absolutely heart-breaking. Her entreaties of ‘pregate per me’ in ‘voi lo sapete, o Mamma’ were absolutely devastating. Of course, she gave us theatre-filling amplitude but she was also unafraid to fine down the tone to a thread. She also gave a fabulously unhinged curse. Her Santuzza is passionate, desperate, defiant and determined. Just as she should be. If Herlitzius broke my heart in Cav then Vladimir Galouzine’s Canio did the same in Pag. Canio is his signature role and he completely embodied his character giving us a performance of raw, visceral power. The voice is huge with baritonal heft opening up to a bright and clarion top. He gave us a harrowing portrayal of a man staring into the abyss with a ‘vesti la giubba’ of unbearable devastation, bringing us and confronting us with Canio’s dark night of the soul. His vocalism has some rough edges – the gear changes are obvious and there were a few too many aspirates in the line but for singing of such sheer insight, they are a very small price to pay. Back in Cav, Stefano La Colla’s Turiddu had a penchant for abusing furniture as much as he abused Santuzza. His was a very Italian Turiddu – a robust and penetrating tenor that frequently dwelt on the underside of the note. He was also able to match Herlitzius for volume. Still, he has solid musical instincts and there was a pleasurable Mediterranean warmth to his singing. Tichina Vaughn was a sassy mob mother Lucia, sung in a resonant, brassy mezzo with good sheen. 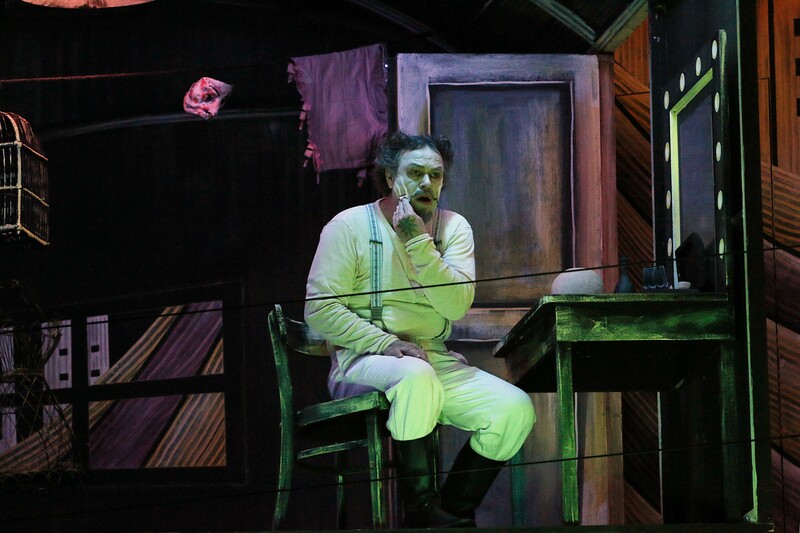 Straddling the two works, Markus Marquardt sang both his roles in a rustic baritone that had a tendency to be slightly hollow and dry. He does have a good line though and his A-flat in the Pag prologue was magnificently full. Carmen Giannattasio was a lovely Nedda – her ‘stridono lassù’ wistful, beautifully shaded and soared magnificently. She blended nicely with Sebastian Wartig’s Silvio who sang with an attractive but somewhat narrow baritone. Aaron Pegram dispatched Beppe’s music with handsome tone and an easy line. This was a remarkable evening in the theatre, showcasing two central performances of visceral, unbearable power from Herlitzius and Galouzine. They were surrounded by two very fine casts who certainly represented the exalted standards of this exquisite theatre. The staging, while displaying signs of intelligence felt somewhat overdone but was a more than effective framework for the action. With conducting that genuinely lived and believed in the works and outstanding contributions from the superlative house chorus and orchestra, this was most definitely an evening to remember.